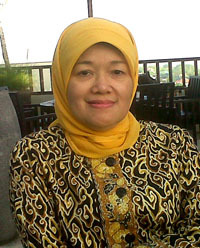 Ms. Dini Indrawati is a Senior lecturer and researcher at the Department of Economics, Padjadjaran University. She has been a researcher at CEDS since 1987. Ms. Indrawati earned her bachelor degree in economics from Padjadjaran University, Indonesia (1983), a Masters degree in planning economics from Indonesia University, Indonesia (1998). Ms. Indrawati’s research interest is in the area of poverty. Setiawan, M., Indiastuti, R., Indrawati, D., & Effendi, N. (2016). Technical efficiency and environmental factors of the micro, small, and medium enterprises in Bandung city: a slack-based approach. International Journal of Globalisation and Small Business, 8(1), 1-17.